The visible also always conveys the invisible. All the more so in the cheerful world of consumerism, in which we live today. The more perfect its surfaces, the more its opposites also seem to resonate – the suppressed and the absurd. No painter has understood this better than Andreas Schulze. The Cologne based artist, who has been associated with the gallery since 1983 and a professor at the Kunstakademie in Düsseldorf since 2008, examines the most mundane objects from his personal surroundings. He arranges trompe l’oeil peas or geraniums in humorous tableaus, and places sofas, plastic windows, or Mars bars in the spotlight, gleefully distorting fundamental forms that today are usually the realm of architecture and abstract painting. With a wink and in a non-judgmental manner, his cryptic pictorial repertoire exposes the previously invisible. Locating itself somewhere between affirmation and irony, Schulze’s painting makes both the traits of our bourgeois life and its blind spots visible. Schulze’s exhibition “Traffic Jam” is dedicated to the typology of post-Fordian automobile design, advancing a project the painter has repeatedly returned to since the end of the nineties. 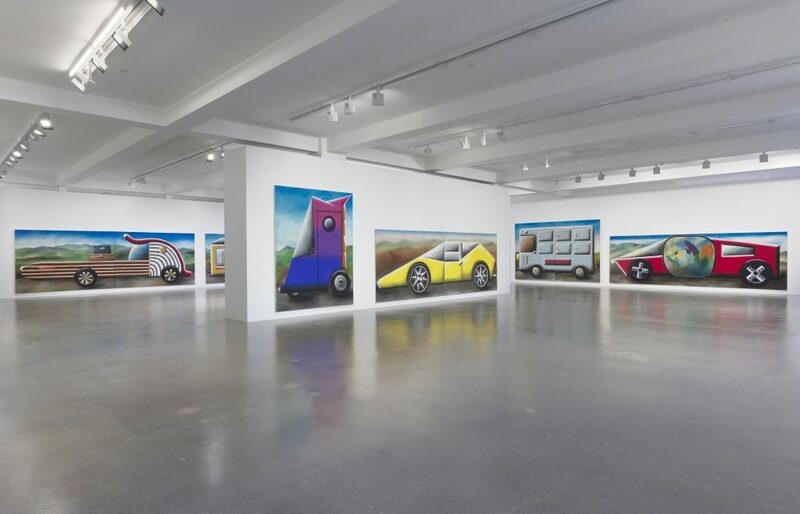 The life-size paintings of a variety of ‘cars’ are arranged in a classical frieze. A frieze of images however where the traffic has come to a standstill. Despite the overwhelming size of the pictures, which are 63 to 118 inches high and 70 7/8 to 196 7/8 inches wide, they appear surprisingly free of pathos. Instead, it is their forceful colouring that catches the eye and the fact they are fundamentally flawed. The cars look like a painterly collection of car doors, bumpers and windscreens that have nevertheless been composed by the mischievous hand of a child. Whilst none of these sport cars, family cars or camper vans would in reality be remotely driveable, they nonetheless remain clearly recognisable as cars. They are works that exploit our collective pictorial comprehension of the “car” as an everyday object, whilst humorously destabilising it in the same breath. Works that seem to ridicule the fetishizing of this industrial product, nevertheless place great value on the need for such fetishes. Schulze’s “Traffic Jam” paintings are testimony to an extremely distinctive style of painting. In a similar manner to his entire output they possess a unique stylistic signature. A painting by Andreas Schulze is always instantly recognisable as a painting by Andreas Schulze. In an era of rapidly changing and volatile painterly styles this remains a unique quality. Schulze’s career began in Cologne in the 1980s within a milieu that, in the wake of Minimal and Conceptual art’s success, rediscovered the painterly for themselves. Even then Schulze moved with innate confidence between myriad popular styles, attitudes and ideologies. Despite contact with the so-called “Junge Wilde” of the Mülheimer Freiheit group of artists around Walter Dahn and Jiří Georg Dokoupil as well as the coterie around Martin Kippenberger and Albert Oehlen, Schulze developed his very own idiosyncratic painting style, combining the figurative with the absurd. A painting style which, even though it had little to do with that of his colleagues, nevertheless did not exist in an art historical vacuum. On the contrary, Schulze’s paintings resonate with a multitude of art historical references: from Donald Judd’s “Specific Objects” to Oskar Schlemmer’s “Triadisches Ballett” (Triadic Ballet), from Andy Warhol’s Pop art to René Magritte’s Surrealism, as well as the Naïve art of Henri Rousseau. Schulze’s unique position in contemporary painting has long earned him a reputation as an “artist’s artist”, and his teaching at the Düsseldorf Kunstakademie has reinforced his influence on a younger generation of artists. In many regards his painting is timeless. It is a body of work of irritating semiotics, both affirming and undermining our collective habits and customs, an output that has always seemed to alternate between complete familiarity and the absolute alien. The aura that Schulze’s pictures generate is one that is difficult to escape. 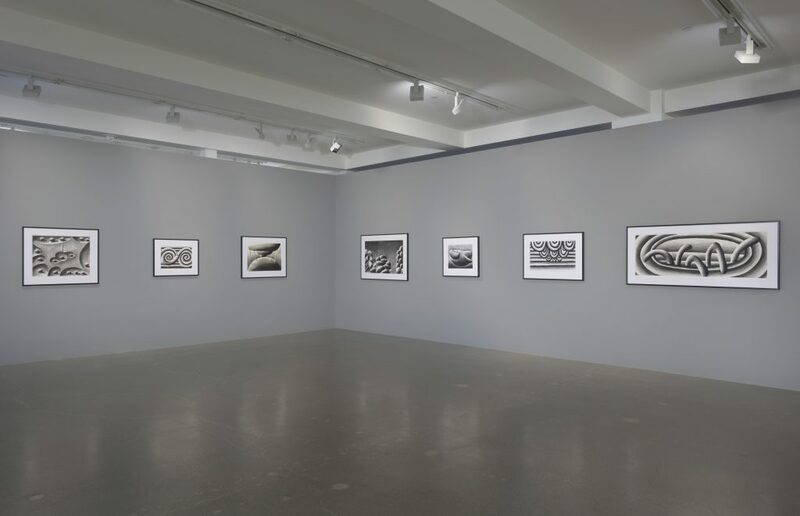 They inscribe themselves so deeply within the viewers’ memory that they are unable to forget them for a long time.